With a vision to help people, Dr. Valerie Sims Administrator and Founder of V.B.R., continues to promote services for Families and children throughout Northern California. Recently acknowledge in the heritage registry Who’s Who tm 2008-2009 edition for her accomplishments, efforts and contributions to V.B.R. Foundation Inc. /Children Services, and efforts to better the American business Community. 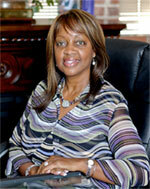 Dr. Valerie Sims began her career as a fashion designer and model in San Francisco California. While she truly enjoyed what the fashion world had to offer, she realized shortly into her career that her real passion was helping people to become a better person. Her first step towards my new career direction with the support of her sweet husband Mr. Bill Sims, She returned to college. As a college graduate, she holds several degrees, an AA in Fashion Design, BA in Psychology, Masters in Clinical Counseling/Pastoral Counseling, and Masters of Divinity with a major in Religious Counseling, Doctorate of Divinity with a major in Theology, and holds several Teaching Credentials. She is currently working on a PhD as a licensed Clinical Psychologist. In 2006, Dr. Sims developed a 3 year plan, her vision increased to pursue an adoption license for the agency, expand the counseling programs and opened the Elk Grove office in order to serve the children in that area. The adoption license will give children that are in the foster care system a chance to be adopted by loving and caring families that understand the need for children that have been neglected, abused and displaced within the system. We are planning for this license to take place in 2009. In 2008, Dr. Sims also saw the need for more services in Tracy with transitional housing for emancipated and foster homeless youth and Gay and lesbian population, this program will take place in 2009 as well. With the need for more supported services in 2008 V.B.R. became partners with Community Partnership for Families of San Joaquin County. As a community leader, Dr. Sims established a new 501-(C) 3 in 2008 called Fresh Beginning which is a drug and alcohol co-occurring program in Tracy. Fresh Beginning, Inc. was formed for the specific purpose of education, increasing, and stimulating public understanding of addiction in all its form (alcohol and drug) and providing education, prevention, treatment and rehabilitation services. The second specific purpose is to assisting clients to develop resources necessary to function in productive healthy manner. Dr. Sims is dedicated to solving mental health problems, as well as working with foster youth in the system, developing resources and aggressively advocating on behalf of our children and families that we serve in this community. Copyright © 2010-2016 Fresh Beginning. All rights reserved.